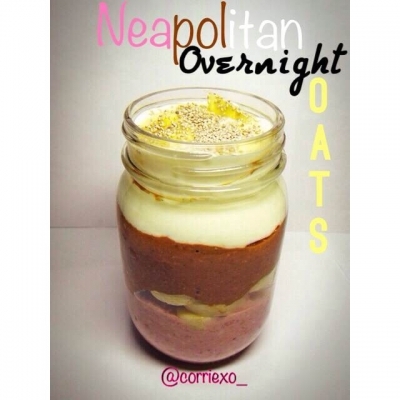 A delicious breakfast alternative for your oatmeal! Layer 1: 1/3 c oats 1/3 c unsweetened almond milk 2 tbsp greek yogurt 6 raspberries 1 tbsp sugar free strawberry jam Stevia to sweeten. PurÃ©e the raspberries and jam and add into your oat mixture. Banana slices in between the 1st and second layer. Layer 3: 1/2 scoop vanilla protein powder 3 tbsp almond milk 2 tbsp greek yogurt Stevia (optional) Mix together and layer on top.